Downtown Stuart will be transformed once again as more than 200 artists and their creations fill Osceola Street along the merchant circle. The gallery-style booths will be filled with every medium of fine art. The popular free, outdoor event takes place on February 23 and 24 from 10 am to 5 pm both days. Proceeds from the Art Festival benefit the Stuart Main Street program. With over 70 gift shops, restaurants, and clothing stores, this quaint downtown area sees locals and visitors alike who wish to enjoy a small town warmth coupled with all of the luxuries of a city. Over the years, this festival has established itself as one of the main art fairs in Martin County. 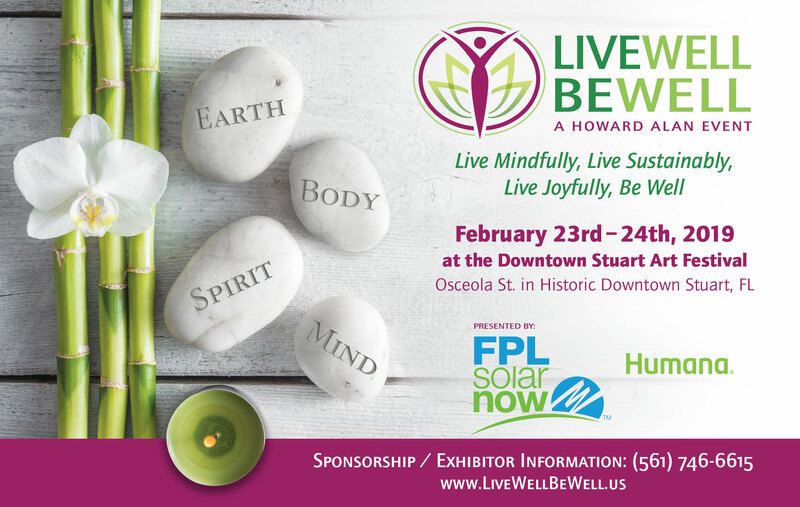 Joining 200 artists’ booths during Downtown Stuart Art Festival will be Live Well Be Well, an entire “festival-­within-­a-­festival” with a dedicated area of booths offering information and demonstrations on current health and medical practices, sustainable energy alternatives, organic foods, homeopathic treatments, state-­of‑the‑art exercise equipment and other vendors dedicated to providing tools for healthy living.